X3D100 will change the 3D Mini Me Business Forever and it will open new avenues, being the Most affordable 3D Scanner which just works. The scanning system offers a profitable all-in- one solution, for which the operator doesn’t requires special know-how of 3d scanning. With this system, you can concentrate on your core business or to market your services. Scanner is based on the principle of Photogrammetry. To capture the scan 100 cameras of 5 Mega Pixel resolution are used. The scanning time is only 1 / 100s and detects objects such as persons and pets within 50 cm - 210 cm size can be obtained. You can Choose 2 Modes Before shooting Either Projection On or Off. In case of Projection Off, the system captures the subject from 100 angles single time. In case projection is On, then 2 captures are done, one with and another without projection. Start Capturing, it takes fraction of a second. The Scan files are uploaded to the cloud and then worked upon to produce the best 3D Model , every single time. Any type of addition to the model like Glasses, Accessories can also be done. 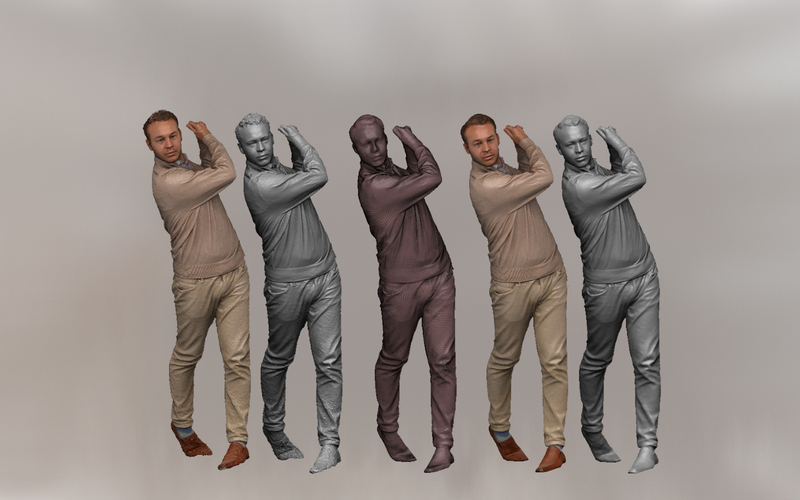 Now your 3D Scans are ready for download and they can be 3d printed, Used For AR,VR, Animation and everything else. Modular Towers Of 7.5 ft height with Intergrated LED Lighting, come with 6 and 8 Camera Configurations. More towers can be added when required. The scanner supports projection controls for better 3d models by using 2 image sets. One with projection other without. Projection is controlled by the software. In order to create professional looking 3D characters, three essential and concerted steps are necessary: Scanning, Processing and Printing". The solution of X3D STUDIO combines these steps into one congruent product. The use of all the necessary value-added process is unique in the industry. The result of this approach is an outstanding and enduring character quality that convinces every critical customer. The full scan of a client takes only a Second and can be viewed quickly by the built-in software on any PC. All subsequent steps such as Processing and even Printing are carried out by us, from one source, professionally and quickly. The scanner transmits all data directly to our team. We have replacement guarantee of 1 year for all the parts excluding wires and frame. The X3D STUDIO is available along the entire value chain as a strong partner. From consulting services, the acquisition of the scanner over the modeling process to packaging / shipping we will help you with our experience and expertise. X 3D Mobile Scanners provides the most affordable 3D Scanning solution which is totally user friendly. This scanner along with the post processing and 3D printing service can turn your photography business into 3D photography business. To know more kindly contact us. Events like concerrts, trade shows and comic-cons that invite heavy traffic can be the most suitable location. The positive and participating atmosphere will certainly create buzz all over. The high visibility and heavy foot traffic make malls an amazing location to put up your scanner. This can lead to a reliable revenue generation. Weddings, Launch events and parties can ask for your hardware as a service (HaaS). The upfront service fee in addition to revenue from 3D scans is a huge plus in such events.